You take a hard hit and the world turns to static. You pull off your goggles, but don't know exactly where you hit the ground. Even worse, you hear nothing when you flick the buzzer switch. This is a scenario that has happened to all of us. Traditional buzzers work well, but when you eject a battery there's nothing to help you zero in on the carnage...until now. 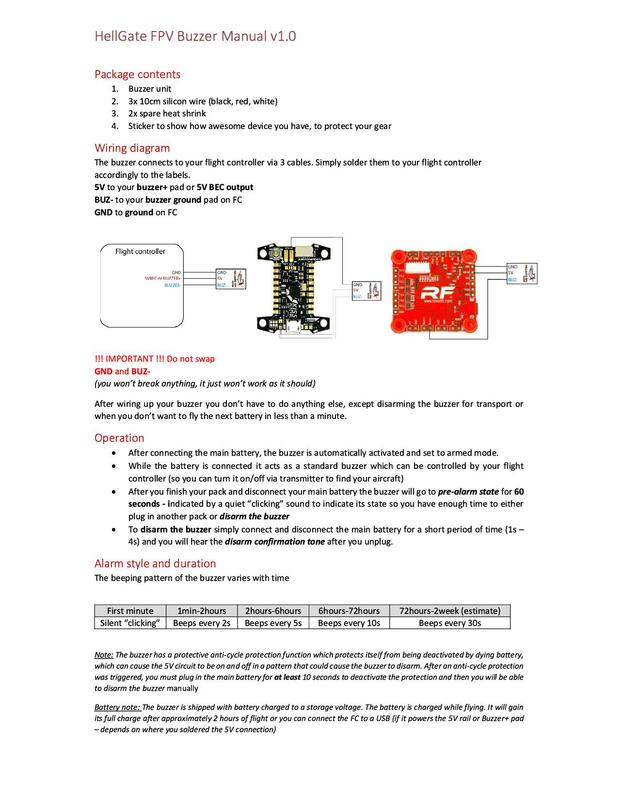 The HellGate FPV buzzer can work like a standard 5v buzzer for your miniquad. However, the thing that sets it apart is an integrated battery. If you solder it onto your 5v circuit, it will take note of when power is suddenly disconnected. After a minute, and as long as the integrated battery lasts (estimated at 2 weeks), you will hear wonderful beeping that will guide you to your downed aircraft. To disarm the buzzer, connect a battery for 1-3 seconds before removing it. You will hear a confirmation tone after disarming the buzzer.